I was born and raised in rural Michigan, but when I became an Army wife, I spent twenty-three years moving all over the United States. The results? Lots of dents in the furniture, and exposure to many diverse styles of folk music. That’s why my play list includes Carter-style bluegrass, ragtime, Texas swing, Irish jigs, American folk ballads, old-time gospel and many compositions of my own. I picked up the Autoharp for the first time when I was in college, working toward an elementary teaching degree. I loved how it harmonized with me form the very start. Also, it was portable; very important for my traveling lifestyle. As a teacher, I brought the ‘harp into as many lessons as I could. It just seamed natural to go from singing for my “kids” to performing outside the classroom. 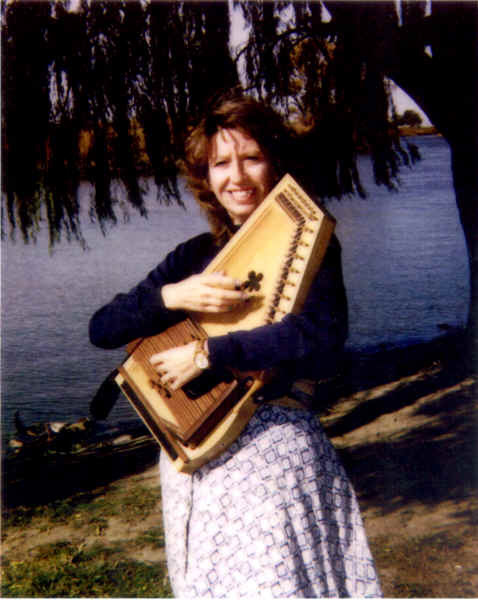 I’ve been an Autoharp musician and a vocalist for over twenty years, performing in folk and bluegrass festivals in California, Texas, Tennessee, Virginia, Pennsylvania, and Michigan. For the past three years, I’ve been an Autoharp workshop leader and an invited performer at Evart, Michigan’s Dulcimer Funfest, an event attracting more tan ten thousand musicians and singers each year. In February of 1998, I was honored to be named top female vocalist at the annual South Texas International Music Festival in Harlingen, and later that year my music was showcased on WDVX, a well respected independent radio station in the Knoxville, Tennessee area. Bob Woodcock in the nationwide music publication Autoharp Quarterly favorably reviewed my first studio tape, Breeze Blowin’ Softly, released in 1997. My new CD, River’s Bend was released in July of 2002, and I’m thrilled with the great feedback my producer and accompanist, Jeff Gardner and I have received. Currently, I work with the Michigan Humanities Council, performing in a wide variety of venues. It is always a pleasure to bring the music I love to my audiences. to pass on to them the joy I feel when I sing, and to teach them about this wonderful box of string and springs called the Autoharp.